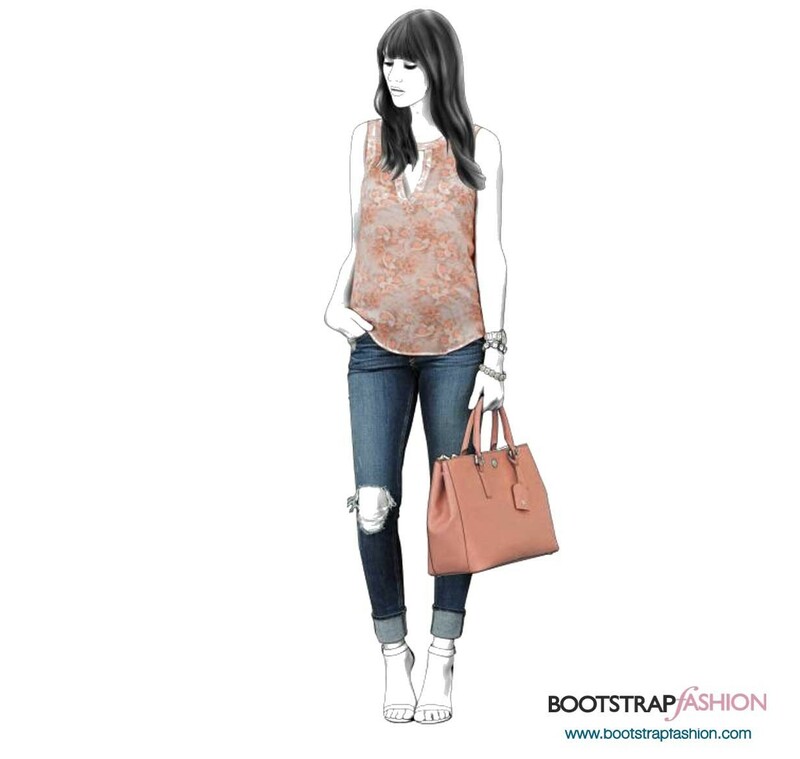 I had really high hopes for the Bootstrap Fashion #45419 tank top (my affiliate link). In many ways, it was really enjoyable to sew. In other ways, I found myself resisting all those facings! Notice the wrinkles on the model around the midriff / just below the bust. Remember this for later when you see me wearing the finished top. I think this remnant of even firmer linen came from Pacific Fabrics or it too may have been from Josephine's too. They've been in my stash for eons! It was high time I used them. It had been so long, that I no longer coveted them, nor feared I'd ruin the fabric if I tried to make something from it. Wow, that sounds like I fear my own shadow. I don't think I do... but there's an opportunity to re-frame my language and feelings around fabric! Because I realized AFTER I had all this cut out, that I had no instructions. None. Like, I forgot to even check to see if I got them from Bootstrap! Whoops! So, I quickly emailed Yuliya. She and her team said they were still working on the instructions but would look into them right away. Within a day or so, I had the instructions in hand. They were quite fast! I was very grateful. And then came the time to visualize the process of assembly. You see, there are NO photos. NO diagrams. The only construction instructions you receive are a list of steps. Often, multiple steps are contained in one bullet or numbered item. This one was a bit tricky to visualize since I really hadn't made a shirt with this many interconnecting facings. I actually spent a week or so plotting out the process, playing with the pieces and visualizing in my head how things might work or might fail. I finally got it all sewn up and put it on. Oh sad. The linen I chose for facings, which matched the brown so perfectly, actually is so very firm that it won't lay down. And then, I had the bright idea to interface it! Silly me. My mom promptly advised me how gigantic the linen rollers are that beat the crap out (tech term, ya know!) of the linen fiber as they process it to make fabric. She said, "it just needs to be hammered and beat up some more and it will probably lay down." As you can tell, I'm not all that excited about this top. And that neck phooey is wacko. It feels weird on too! It kind of stands up. Great for a shirt collar, not so great for a neckline which lays against the body. So the other BIG REVEAL is that well, this shirt is WAY too low cut for me. Like so low, you can see my bra. And this bra is not a full coverage bra. It's a pretty low cut bra to begin with. Mom & I were messing around with the idea of putting a button on the top to pull it in. Watch the video to see more. A button could be very fun! My Dad actually had a really great idea too. He suggested a panel in the V opening that was lighter or of contrast that simply covered up the space. Nice idea, Thanks Dad! It's thanks to both my parents that I am a bit more modest of a dresser. After a bit of life experience, I'm grateful that I prefer to leave more to the imagination at times. Though, the dance floor and dance costumes are my exception to that rule. If you look at the photo below, you'll notice it qualifies for the TOENAIL check. If I can look down while standing or bending and either you or I can see my toenails, it FAILS. And this one FAILS BIG TIME! Like, crap man. I can see my bra, belly, toes and the CAT! Ha ha ha ha ha ha! OMG, that's scary. Don't look. TOO MUCH! This is one of the first Bootstrap tops that I've ever had an issue on fit. Really! Of everything else, they all fit quite well. Though, everything else I've chosen does have a lot more seams or darts and leans more toward princess seaming which is excellent for adapting flat fabric to curved bodies. This shirt is pretty straight. There aren't even back darts. On a different shaped body with similar dimensions... say someone who had a flatter bum, but was the same hip measurement... this might look way more stunning. On my body, it's just kind of bleah. Meh. Not anything to write home about. When I wear straight shirts, like this, that cascade straight down from my bust and do not take into account my waist, they simply make my body look wider than it really is. I am wider at my hips than my bust by at least 5-7 inches. Instead of the eye travelling from a smallish bust to a wider hipline and it appearing to be flattering, it just looks fairly wide all the way. 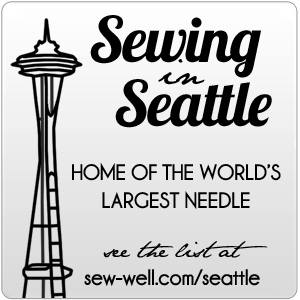 I've occasionally dreamt of all those flowy, boxy, straight shirts that show up on so many of you artsy sewing gals and those you see in Japanese Sewing books. But you know what? That's just not me. It's not flattering and I feel frumpy. I'd much rather wear a piece that gathers at the waist and flows a little elsewhere or that travels down my curves accentuating along the way. You see, even my parents kitty agrees! She says, "I got better things to do than look at your shirt, like bugz to chase, missy!"